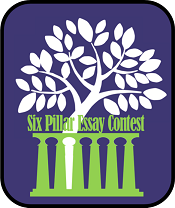 The 6th Annual Six-Pillar Essay Contest awards ceremony was held on April 14th, 2015 at Washington College. There to support the winning students were family members, teachers and school faculty, Character Coaches, United Way Board Members and KCPS Superintendent Dr. Karen Couch. Of the more than 1,400 essay submissions, 33 winners where chosen by a panel of judges and volunteers. Each essay was blindly read and critiqued by multiple independent judges in the selection process. Character Counts Kent County Chairman, Jim McColigan, congratulated the student winners on their achievement – praising them as the top 2 percent. Several students braved the stage to deliver their essays to the audience. Quinn Lindsay of Rock Hall Elementary School shared a touching essay about his role model and brother. Chelsea Bender of Worton Elementary School brought smiles to the crowd as she read her rather convincing argumentative essay; she opened with the line “What do you think about me, Chelsea, a dog owner”. Chelsea proudly showed the audience a picture of her new dog at the conclusion of her reading. Destiny Frase of Kent County Middle School shared a heartwarming essay about her appreciation, respect and admiration for her mother. Cheyeanne Eggers of Kent County High School concluded the readings with an essay about taking responsibility. Cheyeanne proudly spoke to the audience about her journey towards accepting responsibility for herself, her actions and her successes. Following the essay readings, 1st, 2nd and 3rd place winners of each grade level took to the stage to accept their awards. Students were joined by teachers, character coaches and mentors on the stage to commemorate their achievement. Special thanks were given to the United Way for sponsoring the contest, to Washington College for providing an awards venue and to the teachers, parents, school faculty and character coaches who supported the student writers. Character Coach, George Best, photographed the awards ceremony to view photos, click here.